Recurring invoices are used when tenants are billed for a fixed amount on an ongoing basis, such as for shop floor rent, rubbish removal or car park rent. Outgoings may be charged in addition to Rent and an estimate of Outgoings is often calculated and charged monthly as part of the recurring invoice process. However only the Actual cost of Outgoings may ultimately be charged to the Tenant so at End of Year a comparison is made between the estimated Outgoings (Budget) and Actual costs and any difference invoiced for or refunded to, the Tenant. Recurring invoices are initially set up when creating a new commercial property, however, they will be updated when a tenant is attached. Refer below for steps on both parts of the process. 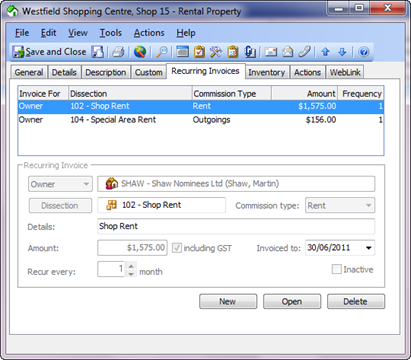 Go to Gateway bar, click Rental Properties and then double click the commercial rental property record you require – the Rental Property dialog box displays for the tenant. Click the Recurring Invoices tab. Click New to enter details for this invoice. Select whether the recurring invoice is for the Owner or a Creditor. if you select Creditor the Find dialog appears. Click Dissection to select the correct income dissection for this item. Select the Commission type applicable; Rent, Outgoings, or (none). Enter the Details of the invoice. Enter the Amount of the invoice, and tick if it is including GST. Select the period of times to Recur every: month – eg. a value of 3 indicates recurring every three months. Select Inactive only if you want the invoice to be inactive. Click Save to save this line of the invoice. Commercial invoices often have multiple lines ie. Rent, Outgoings, Car Park Rent, Marketing Contribution etc, click New to enter additional lines. Leave the Invoiced to field blank. This field updates automatically when a Tenant file is allocated to the property. On closing you will be asked if the rental property has been gained – choose Yes and select the source ie New Management. This information will flow through into your Statistics report for this period. 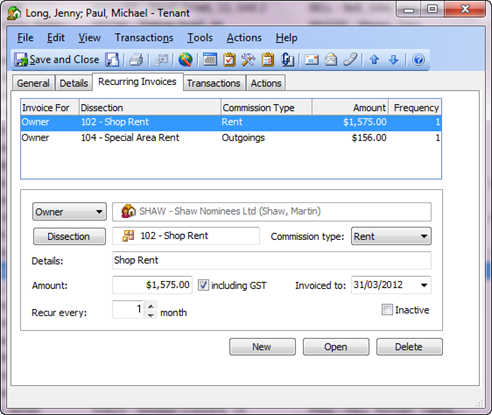 Note: The Invoiced To date should be updated in the Tenant Recurring Invoices tab only. This field records when this tenant has been invoiced up to using the Invoices Wizard. 1. Check the recurring invoice details match the details on the lease agreement. 2. Click Save and Close. On closing you are asked for statistical purposes if the lease has been gained – click Yes. Note: Any changes to the details of the invoice will need to be made in both the Tenant and the Rental Property Recurring Invoices tab.